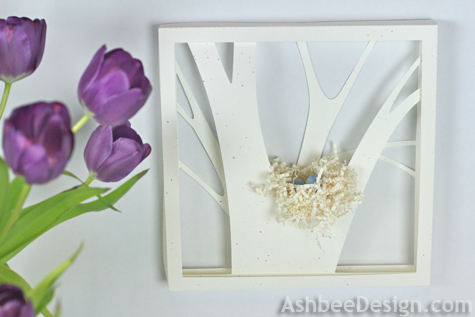 Earlier in the week I posted my "Welcome Spring" wall art promising a tutorial. Things don't always go exactly as planned. My computer died!!!!!! I have just returned from a trek to the Apple Genius Bar and learned that the solid state hard drive I installed has failed. Good news is that I do back up. Bad news is that I am sharing my husband's computer until a replacement hard drive arrives. (I love Amazon Prime. It will be here tomorrow). And it will be a chore because I have been needing to upgrade to Mountain Lion for a long time. So I will be doing a clean install of everything, not just the transferring forward. For years and through many computers I have just transferred all applications settings and data to the new computer. It is so easy. But about 3 computers back my email program was corrupted and that corruption has just travelled forward with me. Time to clean it all up. Talk about a major spring cleaning! In the meantime I am extremely grateful to my husband but I am sharing so my time is limited. And I am missing some of my programs - like Photoshop! I won't be watermarking my photos today for sure. 3 12 x 12 sheets of card stock - Color your choice. I made 1 from speckled white and one from cream because of the color of my nesting material. Cut the 12 x 12 card stock into 3 Squares. Be precise. They need to be 12 x 12", 11 1/2 x 11 1/2" and 11 x 11". 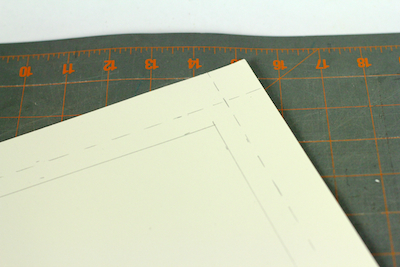 Using a ruler and sharp pencil measure in 1" and 1 1/2" from all sides of the 12 x 12 square. Measure in two places, make marks and draw straight lines. The outside line at the 1" mark should be dotted because this will be a fold line. The inside line at the 1 1/2" mark should be solid because this will be a cut line. Measure in two places on all sides 3/4" and 1 1/4". Draw these lines again with the outside line being dotted and the inside line being solid. Measure in two places on all sides 1/2" and 1". Draw these lines again with the outside line being dotted and the inside line being solid. The 12 x 12" square is the outside frame. Put that aside. 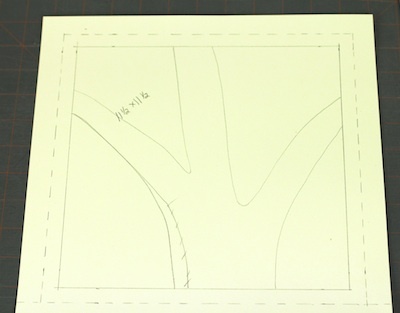 The 11 1/2" x 11 1/2" square will be the front tree. On the back side, draw a simple tree notch for the nest location. Below is the sample for this tutorial. It is a little too complicated and would have been better if there was only 1 notch like my original design shown at the beginning of this post. You'll see I had trouble positioning the nest at the end, so keep it simple! It does not need to match mine. There are an infinite number of tree compositions. Don't have the notch in the center. Have the notch in the lower third and off center. Tree branches get thinner as they grow. Don't have them get thicker near the top. 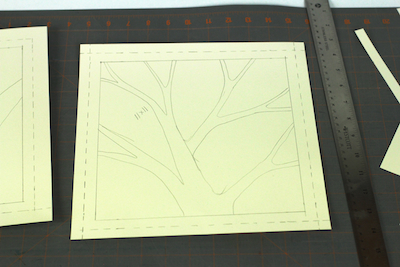 On the 11 x 11 square, draw the inner layer of tree branches. These are smaller and more complex. The base of this should be located behind the base of your tree in the other frame. All branches should intersect with the frame. Cut out the first frame. This is the 12 x 12 square and you cut out the entire center. Use a sharp exact blade and a ruler. Now cut out all the interior parts that are NOT tree branches from the 11 1/2" square and the 11" square. This is the step that the cutting machine would do but you can do just as well by hand. Leave all the branches attached to the frame. 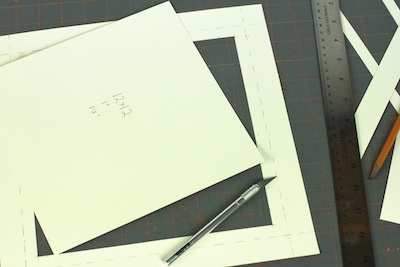 On each of the three frames you need to cut in one cut in each corner just to the first fold line. I have marked them in hot pink. You don't need to mark them, just cut them with scissors. 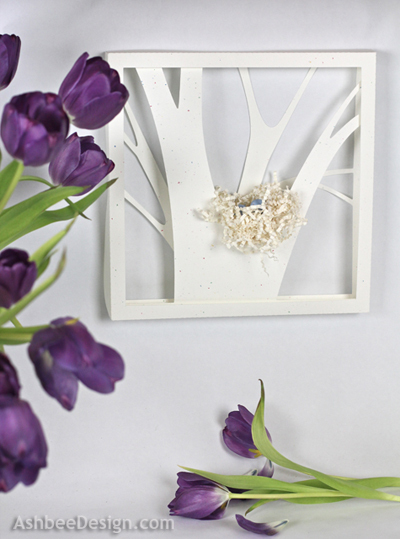 On all three frames fold the sides of the shadow boxes on the dotted lines. I used a Martha Stewart Scoring Board to score on the line and then fold. It is a wonderful tool to add in precise folding. Fold in the tab in each corner. Apply a glue dot and glue the corners square. This will create your 3 shadow boxes. The 3 boxes get stacked together to form the completed composition. Start with the smallest which is the back tree. Put the middle size which is the tree notch on top of it. Put the largest size which is the plain frame on the top. Apply some glue dots between them from the back side to hold them together. Take a small handful of crumpled gift basket paper. You can try to make some shredded paper and use that instead. Place it in your hand and form it into a small nest. Use a glue gun to add a little hot glue in the center and work some of the shreds into the hot glue. Be careful so as to not burn yourself. Using any pointed metal object ( a screwdriver?) poke the edges into the hot glue. I added several globs off glue in different places to hold the nest material together, always trying to keep a nest shape. Trim off any strays that don't want to stay put. Postion the nest in the notch of your tree. Use hot glue to keep it in place. Here you can start to see I had trouble with this front tree design. The notch is too small to hold a bird's nest. As noted at the beginning, I should have had just one notch on the front tree but I wanted to experiment with a different composition. Put some hot glue on the eggs and press them into the nest. They help it hold the shape. This is my finished second composition. You can see the first one was better but that had more to do with the layout of the branches and nothing to do with the Silhouette. Give it a try and send photos if you do! That is so cute! I don't think I've ever seen anything like it. Trying to be creative and bring new ideas to the web! Thanks for visiting. I was fascinated with your other paper shadow box projects, so incredible. My favorite craft is paper crafting/engineering. I'm so appreciative that you have done a tutorial using a craft knife and not a silhouette. A silhouette is just not in my budget at any time. I kind of enjoy the challenges of making things like your shadow box art with my table top tools, my brain and hands. I have to be in the right frame of mind to attempt something like your project but someday I will start this project. First I want to be sure I have the correct type of paper. I noticed the front section has a textured type of paper, think it really enhances the look of the art. You are a very talented and patient paper crafter. I am glad the tutorial helps. As with many crafts, it doesn't always require the expensive tool. Just think about what you have and try to adapt. Many of my Silhouette designs work using an x-acto blade as well. Send pictures when you make one. Thanks for visiting and commenting.